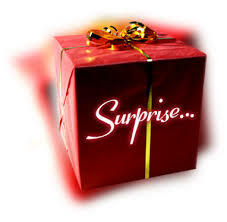 An unexpected or astonishing event is what definition of surprise, everyone of us eagerly wait for something to happen when it was not expected and the real joy can only be felt when such thing actually happens. Sometimes we really make a g ood plan to achieve something and we are very close to final outcome. We feel disappointed when it doesn’t turn around the way we planned, this is also a surprise as it was unexpected event. The sad part with this situation is that we had positive expectation and thing went other way round. The nice part about this is at least you made an effort to reach to final stage. It’s the way we look at the thing and perceive them. It may be little, it may be big, but surprises happen when you least expect it. Take what life gives you delight in it and enjoy it. The path of life can only lighten up as you walk through; each turn in the road reveals a surprise because future is hidden.